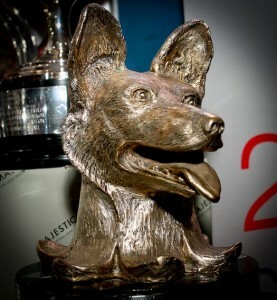 The Wolf’s Head Trophy was presented by Mr David Pearson in 1977 when he was Commodore of the Royal Dee Yacht Club initially for a one-off race to commemorate the Queens Silver Jubilee. The Royal Thames Yacht Club came up with the idea that UK yacht clubs would organise racing to celebrate the Queen’s Silver Jubilee. The race in the Irish Sea was held off Holyhead and it is believed that the race followed a format set down by RTYC. It involved going round a number of buoys over a period of time and logging times, etc. It was open to almost any type of cruiser or racer, with or without a proper IOR handicap. A copy of the rules has not survived but participants recall the race being of a strange format and it was not repeated. David Pearson’s decided that the Wolf’s Head Trophy, after the initial Jubilee Race, would be used for the top dog in the Irish Sea and it has been presented every year thereafter by the Irish Sea Offshore Association (ISORA). © 2019 ISORA. All rights reserved.